Trines are a 120 degree astrological aspect between planets from above that create a flow of energy that easily communicates to us down here below. Get out your Birth Chart Today, 17 July! 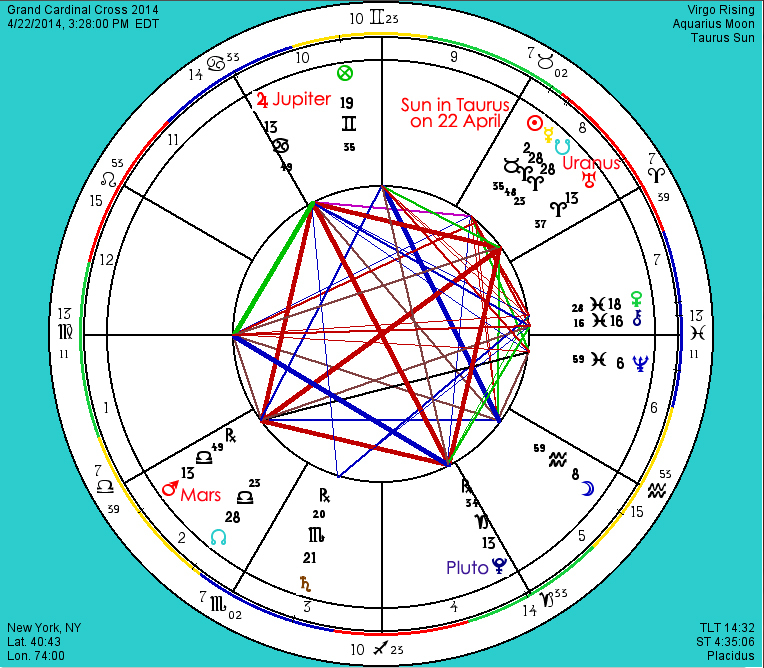 Where does the Grand Trine between Jupiter, Saturn and Neptune at 04 degrees of Cancer, Scorpio and Pisces affect your life? Our planet of luck and joy Jupiter officially sends optimism to responsible Saturn at 1:31pm EDT, and later on in the evening he shouts out to our seeker planet Neptune at 8:14pm EDT. By Friday, 19 July, Saturn and Neptune align to complete the trining process at 9:20am EDT. Trines are a 120 degree mathematical relationship from our Zodiac Skies that creates open, flowing, and easy communication for two planets to channel their energies from as they align at the same degree point between signs of the same element: that of fire, earth, air or water. A “Grand” Trine is when three different planets align simultaneously to make up a full equilateral triangle from above that casts down the opportunity to be wowed by a true interconnected force down here below. As this occurs between three outer planets in our water signs, the receptivity it brings is one that wishes to establish a new sensitivity as well as ways imagination and intuition can be seen between how these water signs and the current transits within them are presently working within your life. What About You? Look to your current transits! Jupiter has just started to bring a new educational process, enthusiasm and growth to where Cancer’s energy always asks for nurturing to thrive within the life. You can be assured that what is attracting to your life here right now will continue to expand and find plenty of ways to allow a positive flow to bring a sense of luck and good fortune to flourish. Saturn -who has just gotten through with asking for a recent review period of bringing more responsibility to the Scorpio piece of the Zodiac Pie- has been slowing down the action in this area of life so you can take the time and patience to learn from your experiences here and find the stability he is asking for you to pay close attention to. Neptune –who currently Retrogrades in Pisces, where The Fishes swim in your life- is in request of reassessing what you may need to do to reconsider the courses of action that are appearing here. With Neptune being a planet that brings immense depth of understanding and urges us to become aware of what may be deceiving us, it is time in the SILENT LISTEN, that will surely unfold the answers to the questions that are more that likely up close and personal here right now. The channel between our personal instinct, emotional control and mass emotions will be ready for profound refinement in our concentration of ideals, our approach to authority, and tempering our enthusiasm with more practical, contemplative, and honorable means of attaining these goals. On the warning side: this energy is easily able to take the entire emotional landscape and create despondent, severe, hysterical, superstitious, scandalous, selfish, and egotistical reactions. Checking in where the 04 degree water points fall in the personal Zodiac Pie will grant the individual understanding of how the practice of patience, listening, and positive thinking will result in desirable outcomes for ultimate progress, rather than attracting negative situations surrounded by delusion, unpractical, and unprofitable motives. Remember at the 04 degree point, this grand alliance is meant to unfold in original, unexpected and innovative ways. Intentions backed by trusting in change, thinking out of the box, and overcoming obstacles will see sound and intense opportunities for growth between these three areas and how they are casting their channel to us all to reap reward from. There is a new way life can be reinvented in a matter of sorts for the collective at large, in where humanity is requested to emerge in a different sense of brotherhood and sisterhood. As Uranus’s energy backs the characteristics coming through at 04 degrees, it is a big fan of equality. Should one remain stuck, it can bring the opposing forces of resistance and judgment. Even more importantly, as you start with your personal experience of how these planets connect so strongly at this time within your Zodiac Pie, when you look to the individuality that asks to be heard from the 04 degree Cancer, Scorpio, and Pisces areas of the life, you certainly will find there is a calling to dare to do something unique if you patiently listen to it.